Use the EOT-3 or TCM-4 (EOT-2 or TCM-3) tangential cutters to cut a wide range of soft and semi hard materials such as fleece, flock, fabric, paper, cardboard, veneer, and more. The EOT-3 is a high end tangential cutter for professional CNC knife cutting. It is the next generation cutter after the popular EOT-2 model. A variety of knives are available from 12 - 120 mm in length. 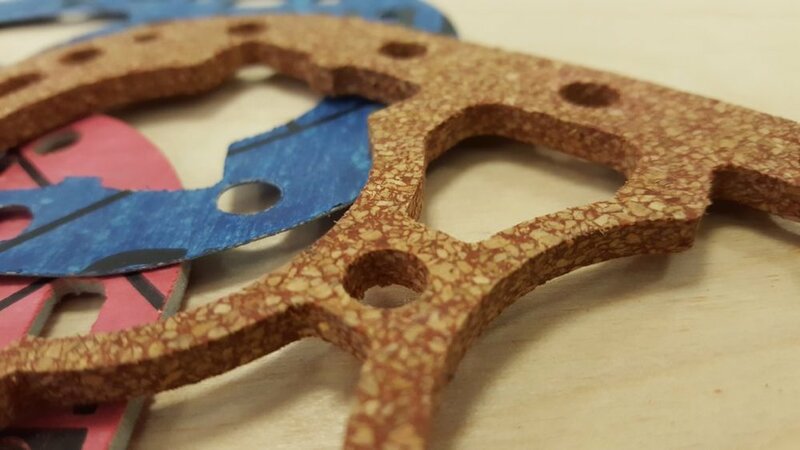 In the example above, gaskets are cut out from cork and sealing material. A very wide range of other materials can be processed. The EOT-3 turns your High-Z into a full fledged cutting plotter. It is even capable of cutting hard rubber. We also recommend using a cutting mat under your stock material. That protects the oscillating knife from getting damaged should you go to close to the table surface. If you don't need an oscillating motion (rapid up/down movement of the knife), then the TCM-4 tangential cutter is the alternative. It is the latest update from TCM-3.